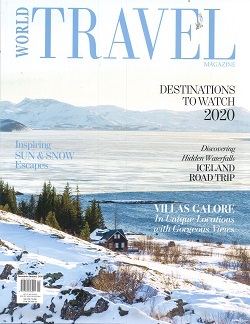 World Travel Magazine is a luxury travel & lifestyle magazine based in the heart of Singapore since 2013. Through our print and digital medium, we cover all things essential in any travel connoisseur’s bucket list while maintaining luxury, our signature distinction. From the latest in gorgeous properties to sizzling locations, tips and trends, we have you covered. World Travel Magazine is dedicated to present the best of luxury travel experiences to affluent readers, bringing travel dreams into focus. The most trusted name in South East Asia, we travel to dream destinations where we experience the culture hands-on and bring our recommendations covering tastemakers, trendsetters, and the latest-and-greatest to our readers. Our well-heeled travellers are brand and trend-conscious, enjoy the exquisite, whether on a life-changing cultural adventure or business and are keen to invest in experiences to explore the luxury travel world in new and exciting ways.